A few sunny pictures from the south side of Key West. Yesterday was a perfect day to be out and about shopping. It must have been a good day to be out because the place was pretty crowded. We went to the market with the idea that it was a farmer's market but it isn't. I think that one goes on in Bayview Park. Still if you want soap or crystal infused oils (I kid you not) this is the place for you. I love the rusty old roof tat survives from the days when this was Cates Automotive selling cars. I quite liked the painted glasses but we are bulging with crystal ware at home so I had to restrain myself. Yes, I have no idea why he was drumming on the roof of his van and he was too elevated and too noisy to ask. So I didn't. There was also more conventional music. It was aimed at us old farts with sixties classics. I love November in Key West with low humidity lots of sunshine and these clear blue skies. Sure I like the drama of summer thunderstorms and huge anvil clouds and downpours, but this is nice too. I kind of didn't look too closely at stuff but my wife did some shopping while Rusty and I stood there. One thing I did find (on my way to the loo) was a local coffee roaster for sale in the restaurant store. Honey, pickles and charms. Not much in the way of parsnips and cucumbers but that's okay. The Farmer's Market should be firing up soon in Big Pine on Saturdays. May be it already has. I was feeling feverish and I was glad we had dropped anchor and the boat was snug up the rivermouth and I had nothing more to think about in terms of piloting, going aground, dealing with the paperwork of a Nicaraguan port captain, while coping with his anti-American bad attitude on top of all the folderol required to enter a new country. All I had to do now was get the dogs ashore and let them run after twenty four hours cooped up on the boat. Puerto Corinto beckoned. Getting ashore was no easy thing as the harbor was designed for commercial shipping and the formidable seawall was designed to support merchant ships so it's only concession to pantywaist recreational sailors like us was a vertical steel ladder set in the gray cement wall. Which would be fine for us but hauling an eighty pound Labrador and a sixty pound Husky was out of the question. One more time I used my initiative to make international sailing dog-friendly and cruised my dinghy to the end of the seawall, found a black sand beach 20 feet wide, dumped the dogs who scrambled up the rocky face only too happily while I went back to the infernal ladder and tied off the dinghy after I scrambled to the top to meet my seafaring dogs. That I did all this running a fever and feeling horribly out of sorts is a credit to the peculiar habits I had developed since we had left San Francisco with Emma and Debs in the summer of that year 1998. By now figuring out how to land the dogs in the most improbable places was second nature to us all. 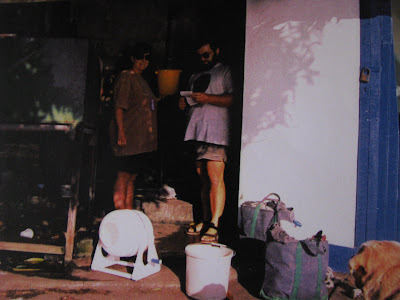 Doing laundry on the dock in Puerto Corinto. In those days sailors traveled with book bags and we exchanged books as we went. We soon discovered the trading left us with romance novels, classics and unreadable dreck, in that order. Now that I store books on my iPhone I am never tempted to miss the days of paper. Never. So if I tell you I read War and Peace cover to cover while moored in the Panama Canal for a month, and On Walden Pond while enjoying Thanksgiving 1999 in the fabled San Blas Islands you will understand I am not being a literary snob, those were simply the most palatable titles I could find at book exchanges. I did enjoy some of them thoroughly I must say and I am proud to be able to say I have in fact read War and Peace in its entirety. Had I had anything else I'd have burned the book rather than put it back in the pile as it was a tedious read and all 1300 pages bored me rigid. There; I've said it. It so happened that while we were in La Union in El Salvador I had found a particular book in the dark recesses of our bag. I felt I should want to read it so I picked up Nostromo and dived in. Joseph Conrad is variously described as the greatest English language author ever etc ... and one can't help but feel he wins the title thanks in part to his Polish upbringing. He is undoubtedly the best non native English speaker to write great literature even if he is not terribly fashionable just now. In school I had Lord Jim and Heart of Darkness thrust down my unwilling craw but as an adult in my thirties a tale by the seafarer seemed a likely prospect. I was listening to BBC Radio 4 recently (love the Internet!) to a serialized version of a new biography of Conrad (LINK) and listening to the reading of The Dawn Watch by Maya Jasanoff I was put in mind of the time I read Nostromo. If you aren't familiar with this novel, and why should you be as it is often described as one of Korzeniowski's lesser books, I should explain it is set in a country unknown to Conrad, a Latin American republic not unlike Nicaragua in fact, at a time of social ferment when Italian emigrants are fomenting drama and a silver mining operation figures prominently. Not exactly a tale of the sea! But finding myself wandering the streets of this unknown port city late at night with my head filled with fever and Nostromo created an extremely vivid sensation of having been transported to another time and place. The streets were empty and the dogs and I walked at random, my head throbbing my breath raspy and all I can remember is the peculiar pattern of the typical cobbled streets, the crumbling Conradian warehouses with wide overhangs casting dark shadows from the iridescent orange globes of the occasional street lights. Everything was dark and silent overhung by a wispy gray mist. From time to time I saw shadows lounging in the doorways of the warehouses they were paid to guard. They said nothing to us as they watched us warily, the gringo and his hounds. Sulaco in Conrad's Costaguana is supposed to lie somewhere in Colombia but that night I was convinced Nostromo the incorruptible was walking the streets of Puerto Corinto. Nowadays Nicaragua is touting for tourism but in those days two decades distant the memories of American explosive mines outside the harbor were still fresh enough and though the people of the town were kind enough one got the feeling the Port Captain was holding us personally responsible for something not good that had happened to him during the civil war and the era of American support for the Contras. His active dislike for us pushed us out of Sulaco/Corinto and we made our way rapidly to San Juan del Sur where Nostromo faded away and yielded to a beach vacation culture in Nicaragua's only truly tourist town. Were you to take me back to Corinto today I doubt I could find my way anywhere, it would be as though I'd never been there. Because in my imagination I never have. The fever broke a couple of days after we checked in and we were gone and all I have left in my head are the images of the dark streets, the orange glow of the street lamps and the image of Nostromo stalking the streets of Sulaco. 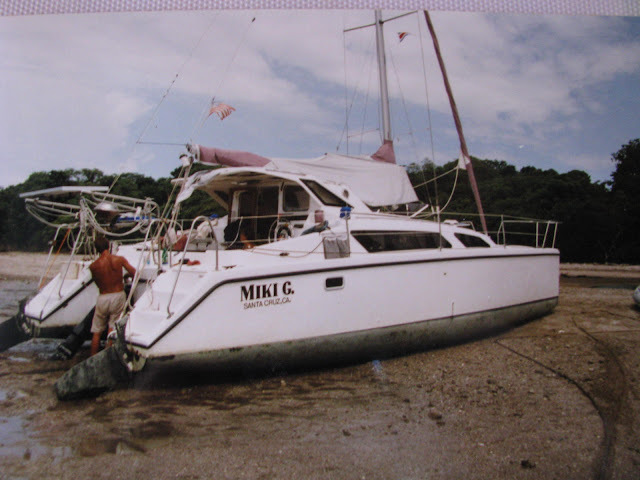 Cleaning the hulls and chaning the gear oil on a Costa Rican beach.